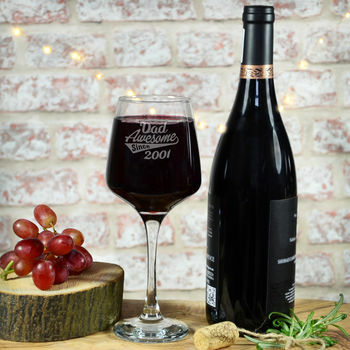 Beautiful engraved wine glass, fantastic present for Father's Day for any important man in your life. This wine glass is a great gift for any Dad, Stepdad, Grandad or any other important person in you life you would like to recognise this Father's Day. The glass can be personalised with a name of up to 15 characters. This product is dispatched to you by Perfect Personalised Gifts.